So now that the phones at Murilee Martin Image Consulting, Inc., keep ringing with offers of vast sums from dealmakers who want a piece of this idea, I feel comfortable sharing the Next Big Thing In Racing with y'all. Admit it, the ultimate form of motorsport would involve 100 or so drunks strapped into ex-cop cars, forced to blow at least a .12 on the Breathalyzer, and then let loose on a figure-eight track for a 500-lap festival of thrown rods, spinouts, and twisted FoMoCo iron. Sadly, the lawyers would never permit such a perfect expression of the American Racing Ethos to take place, and some of you nitpickers might even find a few ethical roadblocks as well. Not to worry! Thanks to the miracle of modern virtual-reality technology, such racing will be possible— in fact, necessary— and nobody will be hurt! What Murilee Martin Image Consulting, Inc., proposes to do is quite simple: once my shadowy backers come through with those suitcases of nonsequentially numbered 500-ruble bills, the DUI Telepresence Crown Victoria Championship Series™ (DTCVCS) will purchase every surplus P71 Police Interceptor in North America. Each will be fitted with full remote-control apparatus, permitting the VR-helmet-equipped driver to operate all the controls from a video-game-style booth. A sensing unit, equipped with stereo video cameras and binaural microphones, will be mounted in the location normally occupied by the driver's head, and a servo arrangement will permit full left-right/up-down "head" motion. The driver will feel as though he or she is really behind the wheel of that Crown Vic, yet will be safe from all the 120-MPH head-on wrecks that we hope will ensue. Of course, before the race begins, each driver must be legally drunk according to the laws of the state in which the race is to be held. Breweries, distilleries, and bars are expected to be the main sponsors of the teams; this will lead to hilarious drinking-game hijinks during the televised prerace action, as (for example) the retsina manufacturer's drivers must chug shot after shot of a vile substance that tastes exactly how Pine-Sol smells, etc. 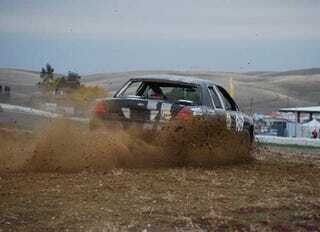 When the racing begins, the audience will be encouraged to throw glass bottles— preferably full— at the racers, with Jumbotron replays of the action whenever some schnockered fan manages to lob a gallon Red Mountain jug through the windshield of a Crown Vic. Car batteries, cinder blocks, and microwave ovens will be available at a reasonable price to fans who wish to hurl something more substantial. The shriek of a hundred Modular 4.6s at WFO throttle, the stench of burning brakes, the spectacle of a dozen two-ton behemoths launched into the ether in an apocalyptic pileup... well, let's just say that NASCAR should start sweating!